Let’s pretend that the first Terminator movie had a baby with the original Robocop movie. What you would get would be Upgrade. It’s a thrilling horror-action film that doesn’t let up for a minute. There is no political agenda to think about during the film. The movie doesn’t apologize for being a guilty pleasure. In the film, everything is dark and grimy, backlit with bright colors, creating vaguely futuristic interpretations of our near future that is both far fetched and possible. In the movie, Logan Marshall-Green stars as Grey Trace, who after suffering a car accident, is shot and forced to watch helplessly while his wife is also shot and killed. Grey is left a quadriplegic and is approached by a young mad scientist/billionaire investor who offers to cure his condition with an implant called STEM that will allow him to walk and move again. So, you’re probably thinking to yourself, “I’ve seen this movie before. Man is out to get revenge over his murdered wife, man is half machine now, blah, blah, blah…” Allow me to assure you that you have not seen THIS movie. The action never stops; the level of gore is at a shocking level. My proof: A man vomited on himself during the screening I attended. Yes, that actually happened. Upgrade is directed by Leigh Whannell, the man who wrote the first three Saw installments and all of the Insidious films. What would have just been an action-revenge film, in his capable hands becomes a Cronenbergian, cyborg, revenge-fueled nightmare. 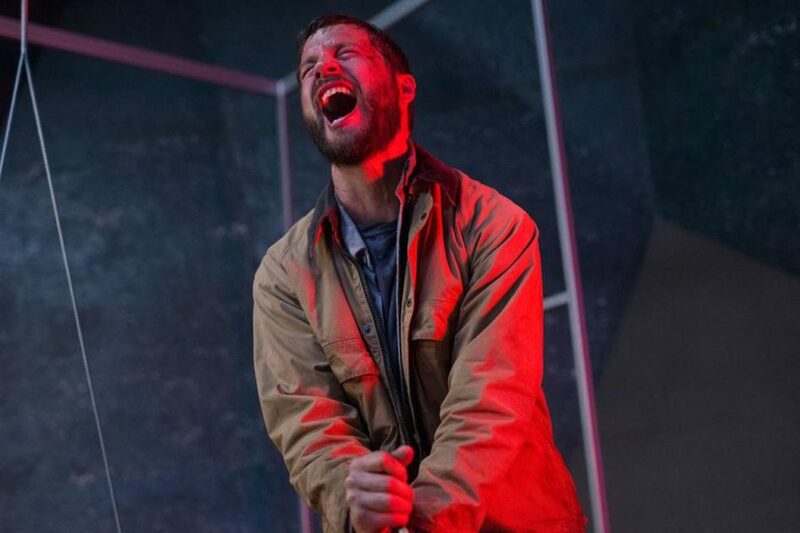 Upgrade is really one of the very best science-fiction films I’ve seen in years. I cannot applaud the film enough. How they managed to pull this film off on the typical Blumhouse budget seems impossible me. The aesthetics of the film are extremely well done. From the biker bar hangout in the film to the rich color in the cinematography, the film is a visual heaven. The camera is repeatedly used as a device to show the power behind all of the action, making the camera almost the lead actor. The special effects in the film are so beyond what seems possible on a Blumhouse budget that I’m astounded. I wasn’t kidding when I said the film was on par with the first Terminator and Robocop films. The film has a gorgeous ’80s vibe to it. This film deserves more marketing. It’s far too good for a short two-week run at the theaters and then off to streaming. This generation should get its very own version of Terminator. We need more than just comic book movies out there and Upgrade provides that. It’s fresh new material. It’s not a reboot or a sequel. It’s new material that pays homage to the great sci-fi thrillers of the past. Upgrade will shock you, it will make you laugh and it will keep you guessing. So, are you exhausted with superhero after superhero movie? Do you like your action movies a little on the dark side? Well then, you will probably like Upgrade just as much as I did. I give Upgrade five stars for imaginative and rather graphic action sequences. Upgrade is in theaters June 1.